Djezzy, Orascom Telecom Algérie S.P.A.
Vodafone, Vodafone Egypt Telecommunications S.A.E. Korek Telecom, Korek Telecom Ltd.
Cellcom Liberia, Cellcom Telecommunications Inc.
CSTmovel, CST – Companhia São Tomense de Telecomunicações, S.A.
Avea, Avea Iletisim Hizmetleri A.S.
Virgin Mobile South Africa is re-launching itself. After six years ago, it has failed to win the hearts-and-minds of mobile phone users. With the emphasis on ‘per second’ billing, it set-out to capture 10 percent of the local market within three years, but has found itself with just 0.6 percent. But now it plans a fresh start, with a new - majority - shareholder in the form of Middle East-based mobile virtual network operator FRIENDi, and with a new CEO. With the first month completed, Jonathan Marchbank is implementing a three-year plan. This time he only wants 1.5 percent of the current mobile market, with some 600,000 new subscribes to lift Virgin’s total to the one million mark. New and improved voice and data packages, as well as the introduction of new loyalty programmes and value-added services are seen as the key. AMETW’s Roy Johnson cites three, related reasons why Virgin has not become a major player in the South African market. These are: slow progress in removing the primary obstacle of high interconnect fees; a failure to capture or possible overestimation of the youth market potential; and a slightly uncomfortable fit between Virgin’s disruptive business approach and the local conditions of consumer and regulatory attitudes. It is not Virgin’s fault that ICASA is under-funded, under-staffed and not as authoritative as a regulator should be. Without timely and assertive support from regulators, an MVNO model is disadvantaged. The youth market was essential to Virgin’s success in the UK and the company has sought the same opportunities in other markets. In South Africa, there is an affluent youth market but it is niche. Assumptions about the developing middle-class segment were made that have not been validated in practice, thanks to global recession. Finally, South Africa is not a mature market where Virgin’s ‘shake up the market’ approach yields a unique advantage. Arguably Knott-Craig’s deployment at Cell C – the hosting mobile network operator and one time share holder in Virgin – has taken on this mantle. Virgin has had little to offer that had not already been seen from Cell C or which could not be negated in impact by reactive price-cutting or new service offerings from the incumbent MNOs. An MVNO’s success depends on beating prices. The MVNO Directory lists six mobile virtual network operators active in South Africa, although it notes that two are more correctly resellers or branded operations. For more, see www.MVNODirectory.com. For more about Virgin's planned relaunch - and why Cell C is now a real threat to Virgin - see 'Virgin readies to sell its new vision thing' in 'Africa & Middle East Telecom-Week' dated 4 October 2012. To keep up-to-speed with the African telecoms scene, sign-up now for the free 'Africa & Middle East Telecom News Briefing' service - e-mailed each week to your in-box. There are two possible views of MTN’s activities in Iran: either business as usual or an international incident. Whichever one applies, it is set to be a case study in terms of risk management. Seven years ago, MTN’s arrangement to enter Iran seemed ideal. MTN was established with a significant amount of South African black capital and expertise. It was a leader even under the minority white government in changing the business landscape, while competitor Vodacom was still trying to sever its own bonds with the old government. As for Iran, it was an old friend and supporter of the incoming ANC administration, oddly parallel to the departing government’s off-the-radar involvement with neighbouring Iraq. Fast-forward to the present and now MTN is facing a spread of challenges. Courtesy of testimony from a former MTN executive, Turkcell has started a federal case against MTN in Washington, alleging that the tender was won by bribery. Looking for some USD 4.2 billion in damages, the Turkcell case would be nothing unusual in corporate litigation in the US except for supporting allegations that MTN: facilitated government monitoring of anti-government organisations and individuals through its network technology; facilitated Iranian procurement of South African armaments in possible violation of UN sanctions; and, most importantly, facilitated Iranian procurement of US technology through third parties which would definitely have violated US and UN restrictions on equipment that could be potentially used for nuclear weapons programmes. It would be invidious to offer comments on quite why Turkcell is only now pursuing the matter years after the event, except to point out the obvious: now is a good time to do so with world focus on Iran’s supposed nuclear arms ambitions. This is very much the sprat to catch a mackerel Turkcell needed to win a court audience for its primary accusation of bribery. Regarding the business case, MTN’s risks are twofold: a loss of some 10 percent of annual revenue and then the imposition of significant damages in a US court. The second part is actually the least of all the risks involved. Not even MTN – with annual revenues of around USD 17 billion – would happily appear in court with a cheque for USD 4 billion and plead no contest. However, should the case be lost and full damages imposed, it would be extremely difficult to exact payment from a South African company with group registration in Mauritius via a US federal court. What mainly is at risk for MTN is the extent to which the accusations might colour other governments’ perceptions about the company, perhaps especially in the Gulf region and other Islamic nations. The issues are serious indeed but if the situation is described as a zero-sum game, it seems that there are two games on the go here. One is the shell-game of routine denials. But the main event is Turkcell’s move against MTN. Turkcell only commands annual revenues of around USD 5 billion but it stands to win something in its battle with larger MTN anyway. It might not win in terms of hard cash but it could hamper future moves by MTN to expand in the Middle East. The full article appeared in the 7 September 2012 issue of 'Africa & Middle East Telecom-Week' which can be downloaded here until 25 September 2012. 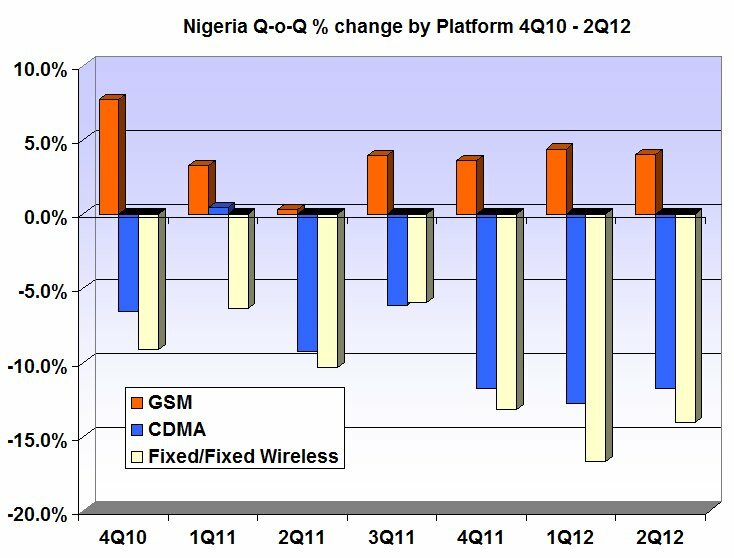 What's the real Mobile Penetration rate in Africa? One of the conundrums in the African mobile market is differentiating between subscribers and subscriptions: or put another way, what is the true mobile penetration rate? Ericsson last month published its ‘M-Commerce in Sub-Saharan Africa’ report which provides an insight to the actual level of mobile penetration in the three countries studied. Using the conventional mobile penetration metric – dividing the population by the number of mobile subscriptions - South Africa tops the table with 127 percent; Ghana is placed second with 86 percent, and Tanzania is in third place with 55 percent. But using the Ericsson research to calculate the number of individual subscribers then reveals an alternative view of mobile penetration with South Africa still in pole position with a mobile penetration of 121 percent, Ghana drops to 61 percent and Tanzania to 35 percent. In relative terms, South Africa’s penetration falls by some 5 percent, but for Ghana and Tanzania the fall is in the region of 30 and 36 percent respectively. 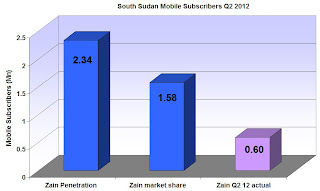 This seems to correlate with Bharti Airtel’s assessment of the market after it acquired the Zain African assets. In September 2010 Bharti noted that the market faced a: "huge challenge with multi-SIM environment and hence the churn levels are high". Bharti said it believed that the real mobile penetration in Africa was around 20 percent rather than 30 percent often quoted; so on this basis subscriber numbers would be third less than the quoted subscription totals. The caveat would be that this applies to developing markets, rather than markets that have matured with good levels of ‘population’ coverage, so lessening the need for multiple SIMs. Ericsson has previously noted that there is a large difference between the number of subscriptions and subscribers. This is due to the fact that many subscribers have several subscriptions. Reasons for this could include users lowering their traffic cost by using optimised subscriptions for different types of calls, or having different subscriptions for mobile PCs/tablets and for mobile phones. To see how subscription-based mobile penetration has evolved in Africa, check out this mobile penetration video clip. Does social media work for Mobile Network Operators? Certainly, there are a ton of case-studies showing social media being a powerful force in business-to-consumer, with corporate teams scouring Facebook by the minute ready to respond to a customer tweeting about some minor outrage in a tea cup. IT News Africa has undertaken a study to see which MNOs have embraced the new channel to market, which begged the question whether there is a link between popularity in the Tweet-sphere and mobile subscriber take-up. In the Top 10 poll compiled by the journal three countries stood out: Nigeria, South Africa and Egypt. So is it subscriber growth supported by social networking; or it is social networking fuelling subscriber growth? 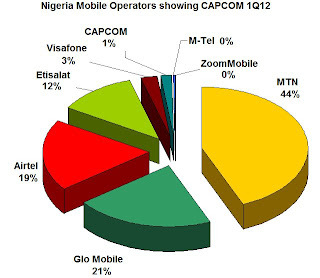 MTN Nigeria was top of the Twitter rankings – almost double its nearest competitor. Etisalat Nigeria held sixth spot. Strange that Etisalat, Airtel or Glo don’t appear in the Top 10. Even stranger when you consider that Etisalat Misr in Egypt is ranked third in Africa – clearly some ‘best practice’ could be shared with other group members, given the task that Etisalat Nigeria has set itself in the next 18-months. The Egyptian MNO has seen what appears to be a significant uptake in 2012. Vodacom is not listed, but Mobinil is. Worth also remember that comments on Facebook and Twitter can be favourable - or they can be highly damning, with many a brave corporate being roasted alive. In South Africa Vodacom was the lead tweeter. Given that the list so far has consisted of operators that are well-established, 8ta – Telkom’s relative recent entry into mature South African market – is in eighth slot. It comfortably beats fellow national MTN South Africa. It would therefore not be a surprise to find then that South Africa’s other remaining MNO Cell C is also in the Top 10. Indeed Etisalat Misr and 8ta demonstrate how ‘young’ MNOs can build a sizable fan base amongst a younger audience. Given Branson’s original success at capturing the mobile youth market for his MVNO in the UK, it seems he might have missed a trick or two in South Africa. Further reading: MVNOs in the Middle East & Africa, with more on the background to Virgin’s new partnership. In a logical, and perhaps not unexpected, move three Nigerian Code Division Multiple Access (CDMA) operators plan to merge their operations to form a unit with greater mass and momentum, and so better able to take on the dominant GSM players. Multilinks, Starcomms and MTS First Wireless are to form a single CDMA network branded CAPCOM. Will CAPCOM will have sufficient muscle to reverse the long-term decline in CDMA subscribers? Or is it doomed from the outset to be smaller than its remaining CDMA-rival Visafone – and both will still lack the muscle needed to give the established GSM operators a run for their money? Indeed, CAPCOM’s starting position with around 1.4 million subscribers still leaves it well short of rival Starcomms with around 2.5 million. Even if one could merge all the extant CDMA operators, the combined outfit with nearly 4 million subscribers would still be a long way short of the smallest GSM operator Etisalat which at the end of Q1 2012 had some 11.9 million subscribers, and was busy eyeing greater things. There’s a chapter discussing the merits of GSM v. cdma in the ‘Africa Mobile Factbook 2012’ – click here to download a copy. I know its a tad tangential, but somewhere in all this could the potential for an MVNO - see MVNOs in the Middle East & Africa - also a free download. The only operators with smaller bases, according to the NCC, are Nitel's M-Tel (GSM) and ZoomMobile (cdma), both of which are notionally defunct. 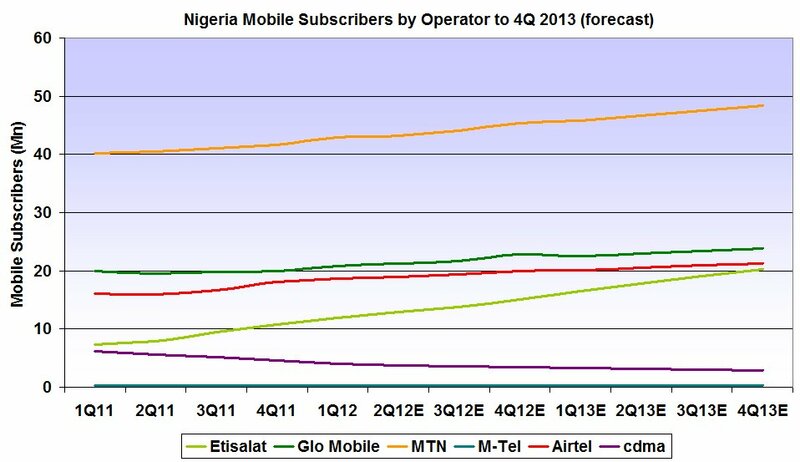 Will Etisalat Nigeria still be ranked 4th by end-2013? 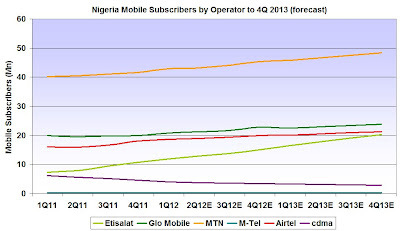 Etisalat is targeting subscriber growth of 45 percent by 2013. 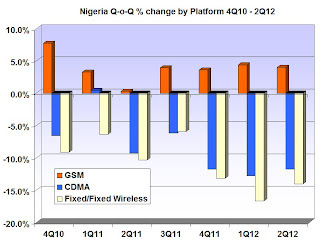 Currently the smallest GSM mobile operator in Nigeria (excluding the moribund NITEL’s MTel mobile unit), it aims to grow its subscriber base to 20 million by the end of 2013 from the August number of 13.8 million that Steven Evans, Chief Executive Officer claimed in an interview with the Khaleej Times. Although Evans said the achievement was through users migrating from other operators, it still leaves the small problem of very well, long established competitors that are also investing in network infrastructure. Is the 20 million achievable by end-2013, and where will it place Etisalat in relation to the competition? Assuming the Etisalat is able to maintain the current high level of growth, then ‘Africa & Middle East Telecom-Week’ estimates it is likely to still be in fourth place ... although closing rapidly on Airtel. Unless, of course, Airtel can leverage all that fibre optic cable it's been laying recently. Readers may like to check out the Middle East Mobile Factbook 2012 which looks at some of the issues facing Etisalat in its international endeavours, whilst Airtel in Africa’ provides a useful summary of Airtel’s first 24-months in Africa, including a SWOT analysis. Etisalat said it plans to invest up to USD 500 million in 2012 and again in 2013 to improve infrastructure and fund expansion in Nigeria.